Cyprus (EU), truly the most unique jurisdiction in the world: an English-speaking EU and Eurozone country that is geographically close to the Middle East and Africa, and has excellent company formation, taxation planning and professional services. Indeed, an ideal investment platform to the EMEA region. Cyprus is a member of the European Union, European Economic Council and Eurozone. At the same time it is also a British Commonwealth country (formerly under British administration), thus maintaining Common law legal system and excellent grasp of the English language and culture. Being a part of such larger integrated communities of course also offers many political and economical benefits, as well as access to increased business development and investment channels. Perhaps most importantly, it positions Cyprus as one of the most unique, credible and reliable locations for professional services and investment activities. At the same time, Cyprus enjoys solid bilateral partnerships and excellent relationships with the rest of the world, such as with the US, Canada, Middle East, North Africa, Russia, CIS countries, India, South Africa and Australia. This makes Cyprus a true gateway for business and international relations between key regions around the world. 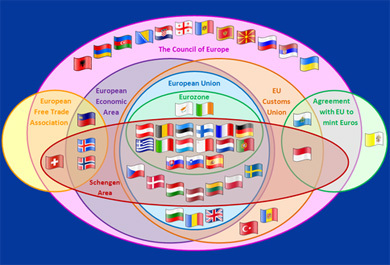 The European Union (EU) is a unique economic and political partnership between 27 European countries. It has delivered half a century of peace, stability, and prosperity, helped raise living standards, launched a single European (euro) currency, and is progressively building a single Europe-wide market in which people, goods, services, and capital move among Member States as freely as within one country. This of course is aiding regional developments and advancements, and the EU's role within the global community. Aside from operating as one single market, the EU is establishing common goals and regional identities to further enrich its citizens; unity in true diversity, progress through globalisation and a village state. The EU was created shortly after World War II, initially in order to foster economic cooperation and political stability – countries that trade with one another are in constant communication and economically interdependent, thus avoid conflict. Since then, the union has developed into a massive single market, with the vast majority of states utilising the euro as a common currency. What began as an economic and trade union fast evolved into an entire community and organisation, representing a common goal; development aid, politics, technology, arts and culture, tourism, to environmental policy. The EU actively promotes human rights and democracy and has the most ambitious emission reduction targets for fighting climate change in the world. Thanks to the abolition of border controls between EU countries, it is now possible for people to travel freely within most of the EU – known as the Schengen zone – and without restrictions throughout the entire EU. It has also become much easier to live and work in another EU country – recognised as EU citizens, with common rights. Operating as a single market, the EU is a major world trading power. The EU is seeking to sustain economic growth by investing in transport, energy and research – while minimising the impact of further economic development on the environment. With 12 new member countries joining since 2004 (Cyprus included), the EU's GDP — output of goods and services — is now bigger than that of the US: EU GDP (€11,785,474.9). With just 7% of the world's population, the EU's trade with the rest of the world accounts for around 20% of global exports and imports. The EU is the world's largest exporter and the second-largest importer. Around two thirds of EU countries' total trade is done within the EU community. The United States is the EU's most important external trading partner, followed by China. The EU accounts for almost 20% of world exports and 19% of imports. A geographic and economic region that consists of all the European Union countries that have fully incorporated the euro as their national currency. Also commonly referred to as "euroland". The Eurozone is one of the largest economic regions in the world and its currency, the euro, is considered one of the most liquid. This region's currency continues to develop over time and is taking a more prominent position in the reserves of many central banks.